There are number of big and small companies in India and other parts of the globe doing Neem based research, formulations, and product development in the areas like Agriculture, Pharmaceutical, Veterinary, Cosmetics, Environment conservation etc. 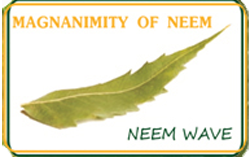 In spite of all this Neem is not getting enough attention. End users of neem based products are not aware of; do not know that there are number of neem products available in the market. If we want that good genuine neem based product should reach to its true end users and if we want Neem to give the position or name it truly deserves we have to create a NEEM WAVE by organizing an memorable event i.e. “GLOBAL NEEM TRADE FAIR“. GLOBAL NEEM TRADE FAIR will offer a platform to all stakeholders involved with the neem business to showcase their Neem products under one roof.